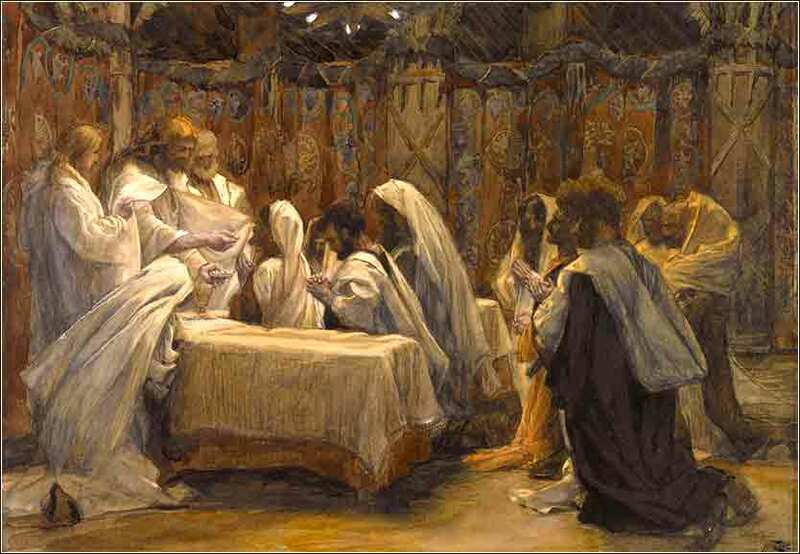 The Communion of the Apostles by James Tissot, ca. 1890. Colours of the Day (with lyrics) from the British 2011 Schools Choir Competition Finals. If this doesn't put you in a good mood — you're hopeless! Money is not a blessing; it's a test. Many of the last will be first. Jesus said to them, “Truly, I say to you, in the new world, when the Son of Man will sit on his glorious throne, you who have followed me will also sit on twelve thrones, judging the twelve tribes of Israel. And everyone who has left houses or brothers or sisters or father or mother or children or lands, for my name's sake, will receive a hundredfold and will inherit eternal life. After all of the scary stuff, about it being easier for a camel to walk through the eye of a needle than for a rich man to get to heaven, it is time for some comfort! The apostles themselves were made anxious; in verse 25 they even ask, “Who then can be saved?” The question can only mean that they fear salvation is impossible, that the requirements are too tough. But Jesus' words, “through God all things are possible” gives hope to all; for God can, indeed, make a camel fit through the needle's eye. We must remember always that the salvation of Christ is not, first and foremost, a salvation of works. It cannot be had by acts alone. It occurs in the heart and soul, when we receive the Holy Spirit. But then we must go back to the preceding verses; holding onto the things of this world makes salvation more difficult and might make it impossible. Faith without works is, in the words of James, “dead”. If the Spirit is strong in us, we will naturally follow Christ more strongly. The lack of a Mosaic law, the lack of a specific set of external requirements that will ensure our salvation, is sometimes disquieting. But we must remember, first, that righteousness through law failed. God only gave the law of Moses, in fact, so that we might realize that we cannot follow it. Anyone who thinks that he has done enough good deeds to earn his place in heaven is kidding himself. But Jesus does promise heaven to the apostles, those who have given up everything — possessions, friends, family, comforts — to follow him. And (to interpret the passage), his teaching “that many who are first will be last” seems to indicate that heaven holds greater and lesser rewards, or at least, some sort of hierarchy. Christ speaks repeatedly to the effect that our actions “lay up treasure in heaven” for us, or that some will be more blessed in the afterlife than others. He might mean this literally, i.e., the more closely we follow him, the greater our joy when the new order arrives. Or, he might simply be trying to depict heaven in terms we can understand. Nevertheless, we must strive for holiness in everything we do. We must not lie to ourselves. Loving our money, giving in to our materialism and vanity, our pride, our anger, are terrible sins, and we must constantly strive to overcome them. 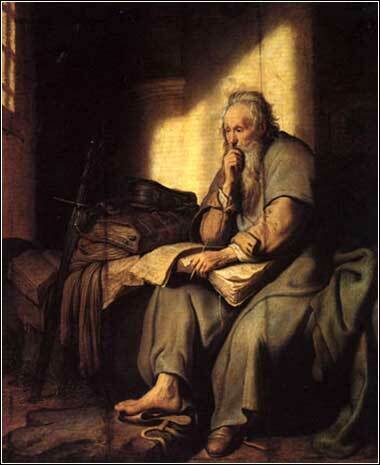 St. Paul in Prison, Rembrandt ca. 1627.